I have said this many times before but I feel the need to say this again every time I watch an episode of this drama which is extremely complicated yet the director Shahid Shafat makes it a visual treat in an artistic manner. There are many dramas in which the director’s idea of a visually pleasing drama is perfect decor, actors who have the perfect looks and the perfect lighting, Shahid Shafat however clearly has a very different concept of making a drama visually pleasing. He has managed to do so by giving the right treatment to this play which is a major reason why this drama is working for me even now when it has crossed the 20th episode mark. The background score, the subtle yet impactful performances and scenes which are always to the point, make this drama more enjoyable. Sami Khan’s performance in Tau Dil Ka Kya Hua has been outstanding throughout but tonight’s episode belonged to Imran Ashraf who completely stole the show yet again by breathing life into a really difficult character. Tipu finally let Maya go not because he was scared that she will drag him in court but because that is what Zoya wanted him to do. Even though Zoya did not like it when Maya asked her for this favor but she was more than willing to help Maya, something which was completely in line with her character. When Maya was in that car and by the time she reached Baila’s house, it seemed like for the first time she wasn’t trying to prove something. I am waiting to see a change in Maya’s character since it is long overdue. Zoya and Tipu’s track took an unpredictable turn since it looked like Zoya wasn’t just feeling sorry for Tipu but she genuinely liked him. Tipu’s reaction and the preview of the next episode however suggested that Tipu is convinced that Zoya and Faris are meant to be together therefore he will continue doing whatever it takes to make sure they end up together. Lubna’s proposal to Faris was yet another surprise! Was she doing this to punish Saif or she really felt that Faris was the right man for her? Right now it seems like both of them are willing to go ahead with this idea because they want to punish Saif. 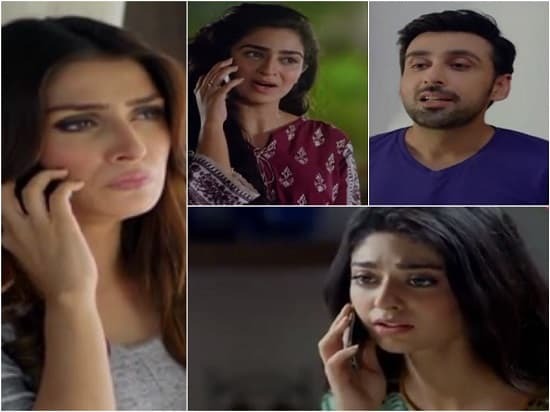 Ayeza Khan performed brilliantly as usual but the whole situation would have been far more convincing if Maya’s parents got a little more screen time in every episode. The drama is probably going to end soon yet Saif has not done anything tangible to take over Faris and Siraj. Saif has invested more time and energy intervening in Faris’ love life than his business. I wonder if the writer has an unexpected twist in store for the viewers in the upcoming episodes. Zahid Ahmed’s role in this drama doesn’t have a lot to offer and his acting leaves a lot to be desired too. Even at this point, it is impossible to predict what turn the story will take from here on. Right now, I am more interested in what Maya has in store for the viewers than anything else since her reaction to what Tipu did tonight was quite interesting as well as intriguing. This episode belonged to the director Shahid Shafat and Imran Ashraf in particular. The overall treatment given to this play has been quite impressive throughout. However, it is time to wrap things up and I am looking forward to an interesting ending hopefully sometime soon.